How Can I Know that a Trip to the Children's Museum in Oak Lawn is Educational? From the time the Children's Museum in Oak Lawn opened in 2003, the museum has engaged educators to ensure that our exhibit ideas aligned with what children were learning in the classroom. Our current Educational Advisory Board is working to make sure that our exhibits continue to meet many of the current learning standards. These standards can be found on the our Exhibits Page as a downloadable file with each exhibit. This is still a work in progress, but our Educational Advisory Board has most of them completed. YES - the Children's Museum can accommodate your field trip! A group of 10 children or more is considered a field trip. Field trips are offered Tuesday - Friday and are limited to 2 hours in the Museum. If you have a group of 100 or more, your trip can be scheduled for a Monday. Field trip prices are $7 per child and $6 per adult. We require 1 adult for every 6 children - so if you have 14 children, you are required to have 3 chaperones. A 25% deposit is required two weeks prior to hold your field trip date. All children in each field trip receive a free pass for a return visit to the Museum! ADD-ON: You can reserve our Multi-Purpose Room for your field trip's lunchtime! Rates - $30 per half hour or $50 per hour. Want to make your field trip unique? 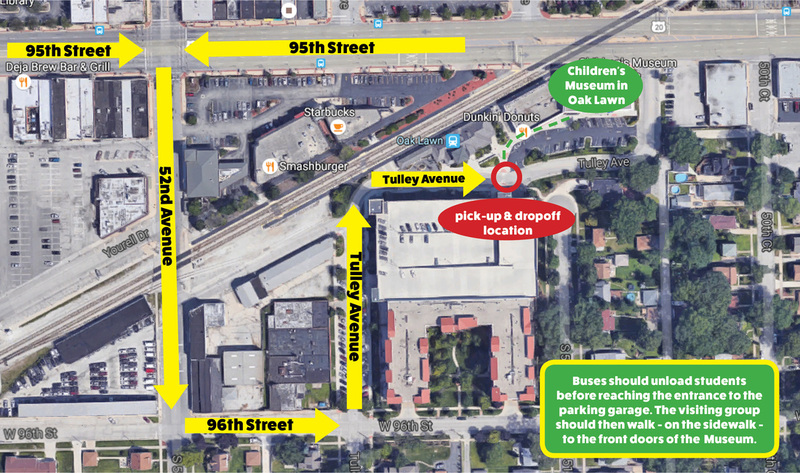 Take the train to the Children's Museum in Oak Lawn! CMOL is located right next door to the Oak Lawn Train Station. For more information on the Metra Southwest Line train schedule, click here. To maximize safety and to make your experience a great one, the picture below shows the Museum's drop-off and pick-up point for buses. There is a sign right before the drop-off/pick-up point that reads "Do Not Enter Until 2:00 PM." This does not apply to field trips coming to the Museum on buses. After drop-off, buses can park in the parking alcove right in front of the parking garage. The parking alcove is right beside where your bus will drop-off the children. If you have any questions regarding buses, please call the Museum at (708) 423-6709 and press "0" when you hear the recording. One of our staff will be happy to answer your questions! Please keep in mind that field trip deposits are non-refundable. However, we will make every attempt to reschedule your trip within the school year.